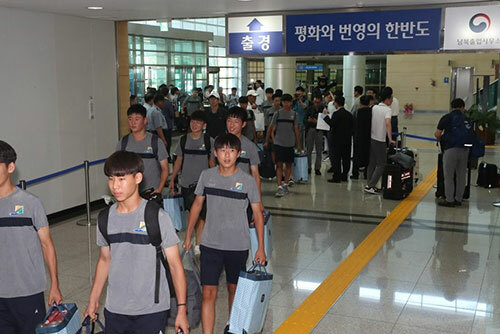 A large group of South Korean youth athletes departed for North Korea and North Korean workers arrived in the South on Friday for soccer matches amid efforts to boost cross-border exchanges following the April inter-Korean summit. South Korea's Unification Ministry said on Thursday that a total of 151 South Koreans, including 84 athletes, journalists and other staff members, will arrive in Pyongyang on Friday to take part in an international youth soccer event. Six countries -- the two Koreas, China, Russia, Uzbekistan and Belarus -- will send eight teams to the five-day soccer competition set to open next Monday. The delegation will visit the North using a western land route and return on August 19th. Meanwhile, a 64-member North Korean delegation arrived in South Korea on Friday to participate in an inter-Korean workers' soccer match on Saturday. The event's South Korean organizing committee said Friday that the North Korean delegation was scheduled to arrive at the customs office in the South's border city of Paju at 10:30 a.m. The delegation, led by Ju Yong-gil, head of the General Federation of Trade Unions of Korea, will return to the North on Sunday.